Chris Raniere, founder and president of San Francisco-based digital marketing agency 46Mile, has seen a lot since his days at early search engine Ask Jeeves and other companies of that era. Steffen Horst: Welcome to the Performance Delivered, insider secrets for digital marketing success podcast. Where we talk with marketing and agency executives and learn about how they build successful businesses and get personal brand. I’m your host Steffen Horst. Today, I’m happy to have as our guest Chris Ranier. 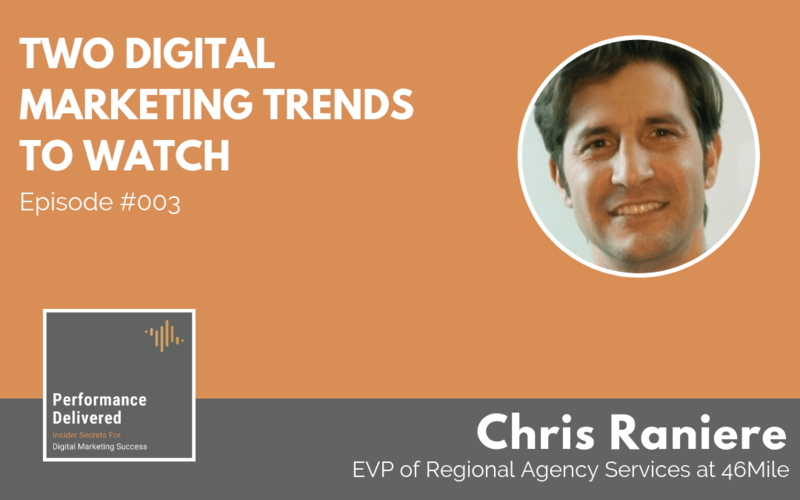 Chris is the president of 46Mile, an award-winning marketing agency located in San Francisco. He has over 20 years business and marketing experience and has founded and sold several companies including the Search Engine Marketing Agency, and a boutique skin care business. Chris founded 46Mile in 2015, and is responsible for the company’s vision, direction, and the day to day operation. Chris, great to have you on the show. Chris Ranier: Great to be here, Steffen. Steffen Horst: Chris, when I looked through your LinkedIn profile earlier today, I noticed that at the very beginning of your career you worked for Ask Jeeves. How did you get that job, and what was your responsibility? Chris Ranier: Well, actually you got to go back further than that, to answer that. Going further back, I actually started out an engineer, and then decided I didn’t like playing with chemicals, and moved out to San Francisco, not knowing really what I was going to do in the mid 90’s. And was recruited with a web development startup company, which ended up becoming U.S. Web, which old folks will remember. And one of our clients there was actually Ask Jeeves. So, I was marketing account executive for Ask Jeeves, at this agency. Long story short, they recruited me to come work for them in their business development group at Ask Jeeves. Chris Ranier: So, that’s how I got started there, yeah. Steffen Horst: So, what did search engine marketing look like back then? That was pre-Google, and probably before Yahoo/Overture. Chris Ranier: Yahoo was around, but search engine marketing. So it wasn’t really search engines back then, right? They were directories. And there was hundreds of people searching the web and lifting the different sites and connecting key words to them. Overture was the first one that came out and said hey, buy a key word and we’ll match it to a result. So the search marketing, it was more people just calling and complaining that their sites weren’t on Ask Jeeves or on Yahoo. I don’t know if you remember that Yahoo had a whole building of people titled surfers. Their job was just to find people. There really was no research marketing back then. However, when I was at Jeeves we went and acquired a company called Direct Hit. Direct Hit had a technology that they called Techstats. Jeeves and Google actually competed to acquire that company. At the time Google was struggling to keep their doors open and Jeeves had just gone public and was worth two billion dollars. So we won the battle. We wanted some of their natural language search technology. But another technology they had was this thing called Techstats that I’ll give credit to Michael Carr came up with. Which led this idea of when you search for something we’re going to give you the natural search results, but we’re also going to give you paid ads that the advertisers are going to put their credit card into. So long story short, Direct Hit invented AdWords, not Google. Google saw it at Direct Hit, and then we took it in-house. I actually ran the group for techstats for Jeeves, for about eight months before I left, and was syndicating those results out. So, that’s when search marketing really started, that was probably 1998, where you were able to pay to get your placement. Then it was just whoever was willing do the elbow grease and stay up at night and make sure their credit card didn’t go to zero. Right, I don’t know if you remember those days, that was the early days. But, interesting history note there, AdWords was not from Google originally. Google just did it better, like they do everything else. Steffen Horst: Yeah, I remember those times. So, did that position lead you to founding Fathom Online, which I read was the first digital marketing agency focused on search engine marketing. Chris Ranier: To be clear, we were the first paid search only, there was a bunch of SEO guys out there, but we only did paid search. It was like 2006, the recession, 2007 was coming along, everybody was shutting down all their digital agencies. I was off doing a video for IT startup, it looked like YouTube in 1998, 99, 00. Which I called bleeding edge, which lead to death, way too early. No, sorry, it was 2002, so after the crash. The internet crash, everyone was basically firing their digital agencies and was stopping doing digital marketing, and just hunkering down. So, myself and my business person at the time were just talking, he had worked at Ask Jeeves, he took my place actually, after I left Ask Jeeves, running AdWords, the text ads. It was his idea, he came up with like, there is no way people are going to manage paid search, it’s going to be a disaster, there’s ten different engines out there, you’re going to have to put your credit card into all of the, you’re going to have keywords, it’s a nightmare. So, that night, over a couple glasses of wine, Fathom Online was born. We’re going to manage just that paid search piece, because no one else can figure it out, and it exploded. I will never forget. Steffen Horst: I can imagine. Chris Ranier: Yeah, when we took money, we didn’t need it, which is the best time to take it. It allowed us to survive a little longer, and get a better payout when we sold, but he was doing due diligence, and he came back and said, guys, I heard this more than once, they don’t know what you’re doing, but they said don’t stop, whatever it is. So, they don’t know how we’re doing it, but a lot of people and a lot of spreadsheets. Yeah, so that was Fathom Online. Steffen Horst: Interesting. I guess, pricing out the service back then probably was much easier, I assume there was almost no competition. I mean, you were the first offering paid search, so how did you approach, back then, pricing the service? Did you do it on an hourly rate basis, did you do it as a percentage of media project basis? Do you remember? Chris Ranier: Oh, I remember. This is going to kill you. So we looked for what was the biggest pain point, the biggest pain point, besides getting results, or managing day to day, the biggest pain point, for advertisers back then, were the fluctuating monthly costs, because they want a certain number of clicks, and the cost to click can change hourly. You just had no way of structuring it. So, we came in and said, we’re going to do flat budgets, don’t worry about. I know everybody does that now, but it just hadn’t evolved, it was so early on, people were putting credit cards in, and they’d spend $5,000 in one minute, and then nothing for two days, and it was back and forth. So, we did two things, we said we guaranteed this budget, and we guarantee this number of clicks. The way we did that was we advertised. So, we had a pretty big spreadsheet, a sort of algorithm, I wouldn’t give it too much credit on that, that would monitor all different keywords and all different verticals. We’d come up with what the average was, and we had a formula to come up with how we’d make sure we came out ahead, no matter how much we had to pay to meet the clicks we promised. So, instead of making 10-15% margins, we were making 70-90% margins. Steffen Horst: Yeah, the golden times of marketing, I guess. Steffen Horst: All I have to say, once in a while these days, I come across companies, as we also, as you know, help other agencies, execute digital marketing campaigns. We come across other agencies that work still with companies that do arbitrage paid search, and it is astonishing how some clients still pay a lot of money and get very little for all that investment, and don’t question the approach at all. With no visibility, nothing. So, it just blows my mind, every time, when I have that conversation, and they are completely oblivious to the fact that they could probably do so much better, with much less investment. Chris Ranier: Yeah, but to our credit, we did a lot, we delivered, we were doing all the way through the conversion analysis. I remember one telecom, I won’t mention their name, they couldn’t figure out why they had such horrible conversion rates. They had 14 clicks to get someone to sign up, it’s an obvious thing, you say now, but we flew all the way to their headquarters and walked them through the data, and go guys, just simplify this. That was way before you had best practices for e-commerce, right? We increased their sales by hundreds of percent. Steffen Horst: Yeah. So, that was pricing back then, how does approaching pricing this day, from your perspective? 2015 you founded 46Mile, as you told me before the podcast, you do obviously, not necessarily focus on paid media as a side product, but you really are focused on website development, video production, more the creative side. How do you approach digital marketing services pricing for that? Chris Ranier: So, on the creative side, like the pure services side, where percent of media doesn’t mess everything up, this is not for every agency, it’s all about hours, and the costs of the hour to you and how much you can mark it up. We go about pricing the way, we build pricing models for every single model we have. In the early days, we’d bring on a website, and we’d take a guess that we’re going to need a creative director, we’re going to need account manager, we’re going to need a Google Analytics specialist, we work it out, build a spreadsheet, and say it’s going to take this many hours, this many hours, and then put a dollar per hour. Then come up with the total cost, and mark it up by like 20%. Then you have to make sure you know your math on how to create an hourly rate, right? Which is typically your annual compensation times, I do 2.3, but more than double it, I do two and thirty percent. In San Francisco it’s kind of necessary. So, it’s tedious, and I think people who get moving really fast, and you get the creative thing and you want to do the right thing, and when you do the math, the numbers sometimes come up pretty high, but that’s why you get in trouble a lot, because clients come back and say well it costs too much. You need the business, and there’s early days when you’ve got to take one for the team, and do it at rate that’s breaking even, but it’s giving you a case study, it’s giving you a testimonial, that kind of thing. I think we all do that. Building A Digital Marketing Business At Cost: A Good Idea? Steffen Horst: That’s actually a good point, that was one of the questions I had jotted down here on my notepad. Have you ever decided to buy, in the case, a client, which as you just said you did. But probably, interesting question for some of the listeners will be, did it actually pay off? Obviously we make those decisions to buy a client because we want a bigger result out of it later, whether that’s a case study that leads to more busy, or whatever we think we can get out of that situation? Did it pay off for you? For the clients where you did it, or did you afterwards say, gosh that was nice, but I wish I would have made some money, because I didn’t get anything else out of it. Chris Ranier: So, I’ve never done a full, “I’m going to lose money on this”. I’ve wavered a bit, but one thing I always do when I come down on price, I go out with the original price, but if I’m going to take dollars off, I take service off, or I take deliverables off. So you’re not doing tons and tons of work, you’re doing the best work. I may do an hourly rate, take off an hourly rate. I can’t think of a client, we have profitability analysis on every single one of our clients, from a gross perspective, so contribution of margin to the rest of the business. We’ve never come in negative, so we’ve done a pretty good job of understanding how much time it’s going to take, from what type of person can get some things done. You come in at 20% margin, you can’t run a business of that, that’s not going to, 20% of every sale is not going to run the rest of your business, paying rent, administration. It was a long answer, to us, yes it has paid off, but it’s not immediate, like we have case studies. I can use it in sales studies, I can explain to people we work in their industry and some other industry. The wine industry we’ve done it in. It’s traditionally a very cheap industry, but if you start showing results, you can start using that to other folks. There are those type of clients in the wine industry, that fit our criteria, that they understand marketing. If can you show them the return, they will pay for it. Our trick is just getting them to pay enough up front for us to show. It’s paid off, but you have to be careful, I have never done something for free. I never do, I don’t know if you’re going to bring this up, but I never do proposals that have any work related to the client. I don’t do research on the client, I never ask the client if we can see their back end for a proposal That’s a lot of work, and that’s valuable. I just think people lose so much money doing that. Steffen Horst: That’s a good point, because a lot of agencies these days, offer free contract analyses and consultation. So, basically, what I hear from you is if someone were to come to and say, hey you know what, can you analyze where we are at the moment and can you give us an idea of strategy and do a top level strategy. That’s probably something you wouldn’t engage in. Chris Ranier: I’ll charge them. You pay me $40,000 I’ll do it for them, but I won’t do it for free. I’ve had some people say fine, then we’re not going to deal with you. I don’t understand an agency, unless you’re a giant agency, and you’re going after a hundred million dollar Coca Cola campaign. Okay great, you’ve got to do spec creative, that has to happen. We don’t deal with folks like, that’s a pretty big caveat for your listeners, at 46Mile, we will turn away big national brands, unless it’s some mixed thing that we fit in to. Brands that do somewhere between 20 million annually, to a 150, maybe 200, after you get over that, you can kind of play with the big boys. But, I’m amazed how many of those folks come, and are usually at government agencies and say, we’d like you to come pitch against those other agencies, and tell us what you’d do for a 12 month campaign. Give us the creative, give us the media plan, and if we like it, we’ll sign you. And people do it, and I don’t know how or why you do that. I’ll show you want I’ve done for other people, and the success I’ve had, and I’ll also tell you that they paid me $50,000 to do the research and the strategy to come up with that plan that then worked. Steffen Horst: That’s a good point, it’s about knowing your own value, and knowing what you’re capable of delivering at the end of the day. Chris Ranier: I think if you have the right sales approach, give me a chance to come in and talk to you and tell you about my people, and this success we’ve had. I was just talking to one our sales today, one of our partners asked for a deck that had this, this, and this, and to send it over. Then there’re going to put that in there and send it to a client. I just told them, don’t do it, unless you have it already have it built, then don’t put it in our pipelines, because I had never, never seen one of those come through. Unless I have a relationship, like, if you know the person you’re sending the deck to, and they’re doing RFPs (requests for proposals), because they “have to.” Fine, I’ll do it then, but besides that, unless you can present, an agency is the people. Hire somebody if they trust and they know can go to battle with them, because it’s marketing, you can’t promise anything. It’s going to be a battle. You’ve got to go to battle with them, if you can get that message across, and then prove that your team can win multiple battles, lose a couple, and win the war in the end. Then you get a partner you want to work with, both sides. Steffen Horst: That’s true, that’s totally true. A second ago you mentioned RFPs, so what’s your position to RFP, and it might different from a media perspective, to a creative perspective. Us, for example, we get RFP, then there’s a lot of kind of unformed thinking asked. How is that for you for a company that is more creative focused? How far do you go with RFPs? Chris Ranier: We do 50/50, like, we’re a full service digital marketing agency. I may have misled you, we do a lot of creative, but we have a large planning/buying group. Same answer, no matter who I’m going after, I usually hit delete when I get an RFP, full stop. I don’t do them. The exceptions are, one exception is, I’ve been working, for example, with a client, they’re in a government agency or education, and they have to go through RFP by law, and I help them write it. I’ve done that more than once and we win each time. You write an RFP each time, they get a bunch of submissions because they have to, and they compare you to somebody else, and you wrote the RFP, so your response, is it shouldn’t be the best response. So, I’ll do those. The only other ones that we’ll do, is if we know the people and we’ve got an inside track. So many times if you follow up on an RFP that you lost, somebody knew somebody on the board, somebody new was recommended by somebody’s friend on the board. RFPs, if it’s a true RFP process, they tell they look at a whole bunch of stuff, but it’s price. They ask a lot of questions that most people can’t answer all them. Again, if we can’t present to them, from day one, I just think your chances of winning are slim. If you do win, you’re going to spend so much time going back and forth, presenting again, beating down prices, and then you usually have to go to procurement. Add up the hours in that, and I just don’t think, I’d rather spend it going out to clients that don’t want RFPs. Steffen Horst: That’s a good point. So, we talked almost the entire time now, about the more creative side, like you just said, you’re almost 50/50. So, how would you price out your media side? Where there is media buying obviously, but also strategy and planning, how do you approach that side from a pricing perspective? Chris Ranier: So, we’ve got two ways. Our ideal client comes to us and says, I’ve been doing marketing this way and I realize times are changing, and again, remember we work with large regional brands, so they’re kind of where national brands were 20 years ago. They’re realizing how I’ve got to work, at least five different channels, maybe more, and I’ve just been buying left, right, and center. I’ve got to pay the search guy, and I’m paying the social guy over here, and they don’t work together, what am I going to do? They also realize, to do that right, they need to really know who the audience is, and they admit they don’t. Maybe, they look at how their competitors are doing, and then put a plan together based on research. Do a grown up marketing plan. In that case, we do a consulting project fee, project based fee, where we do the research, which is part of the media, as well as messaging, learn the audience, where they interact with media, how they interact, what type of messaging we want to do to them. Use that research as a project fee, and then we take the research, and we use the research then to do sometimes a full marketing plan, or a media plan, which is again, a project fee. Having been on the other side many, many times, I hate tons of material. Tell me again how much it’s going to cost me to get what you said, and you take the risk. If you don’t know your business well enough to tell me how much it’s going to cost, it’s not my problem, as a client. So, those fees, like the research fee is usually about $15-25,000 to get all that information. A small, like just media strategy, around 12 to 20 grand. Whereas, a full marketing strategy and plan, which comes out of a calendar, it does everything from PR down to website development and social media and paid media. That runs $20-35,000. So, you’re ranging from $30-60,000 to get a whole thing together. Then, you’ve got a schematic and a basic media plan coming out of that, with a budget. Then, we run that, we’ll run those media, those paid medias for around 20-25% of the net media. Here’s something else we don’t do, we don’t do a single channel. So, we won’t do somebody’s paid search, just not interested. If you’re doing that, that means you’re just looking for the cheapest provider, and you hopefully have a strategic plan behind you, that says paid search is supposed to deliver this, paid social this, programmatic this, print this, radio this, right? You’re managing all of that, and you’ve got all these different contractors working for, which is a nightmare, but you know what you’re doing. Or, you don’t know what you’re doing and you’re just going for the lowest price, at a single point solution. Then that’s a nightmare client as well. So, when we take on a media plan, it is a paid media, it is a paid media, and we own all channels that are paid for that campaign. Our campaigns, we have full digital campaigns, and if it’s a full-digital campaign, which I imagine most of our folks are handling, we take a lump sum budget, and we come up with a plan that has different forms of programmatic. Your paid search, your paid social, and any content marketing we’re going to buy. Have a plan, a plan is only as good as making a plan. Then we start running it, and we swap budget as needed, and we’re not competing with anybody else, because we own the entire budget. It’s a success metric. So, for that, we usually charge around 30%, which most people are going to go, no way he gets that, and I hear that. I sit with clients and I say, look, I charge 20%, because I’m not going to charge you any other fees, and I’m not marking up my programmatic media buying side. Which, Steffen, I honestly will tell you and your listeners, I am considering at 30%, we’re not making enough money, I should probably be marking up my programmatics by 60%, but most clients don’t know that. We tell them 30%, you’ll see everything, total transparency. You’ll have all the raw data at your fingerprints, and we’ll be able to analyze and help you to grow during the campaign and after the campaign. My best example for this is a very large campaign that we’ve now run two years in a row. They’re a non-profit, it was us against somebody else, we came in and told them 30%, and the digital marketing came back, Chris, I love what you guys do, you have the data, you have the tools that other people don’t have, but it’s a non-profit, they’re telling us they’ll do it for 12%, I have to talk to my board of directors. I said, tell you what, do this, go to whoever’s offering you 12%, get them to put in writing that they will give you all the invoices, from all of their media vendors, that they will not charge you for any reporting, any tack-on fees, and the whole list you know Steffen. They give you that, then go with them. We’ve been running their campaign for two years running now. Steffen Horst: That’s a good point, the hidden costs that the providers put in that clients don’t see or that they’re oblivious to, sometimes makes the 12%, 10%, 15%, much more expensive. Actually, you already answered the follow up question, how do you deal with a client when they say, are you crazy, 20-25% for paid media activity? I assume you aren’t always in a situation where they have another company that says 12%, how do you convince them, in addition to what you already said, that it’s worth the 20-25%, when the market, on average, depending on spend, is more towards 10-15%? Chris Ranier: Yeah. I’m probably a little more bull headed with this than I should be, but I did believe that someday we’re going to get back to, let me put it another way, you can’t run a campaign effectively without making at least 30% on the net revenue. You ask any agency or finance site, to do the math, you just can’t do it with the people you have, and you probably aren’t even doing that well then, unless you got a lot of lock in. I tend to have an honest conversation with the client, and again, I really like the space we’re in, in that large regional brands, like a lot of them have been running these campaigns themselves, or trying to. You just tell them, do you know how hard this is? They’re like, uh, yeah. And you haven’t been able to put the tags, and you haven’t been able to track perfectly, and you haven’t been able to pull all the data together, and they go, I know, I know. Well, that’s what we’re going to be doing, it just takes a lot of time to do right. It’s not like buying a newspaper ad and letting it run. Those are conversations I’ve had, I’ve got to admit, I’m even surprised, just by standing out ground. They push and go, this is what we do, that’s us. Most of the time, they end up going with us, and they’re happy. Steffen Horst: I guess at the end, you need to know the value of your service. I believe that’s something that every individual, consultant, agency owner, business owner, needs to be aware of, and also needs to be proud of. The service they deliver costs a certain amount of money. As I always say, when I have conversations with clients that say, well, why does this search solution cost 50%? Well, go to another agency, they put someone on that has a year experience and hasn’t seen that many different scenarios. The results from that person will be different from someone on our end who has at least 4 to 5 years’ experience, that has seen different types of campaigns, different scenarios, and can respond to things much quicker, and can avoid the time that sometimes takes for new people to figure things out. And if they want to go with that, then go with that company. Half a year later they usually call and say, you were right. Chris Ranier: I don’t want to be totally arrogant, it is hard. There’s always someone out there, and the client, they’re in a hard spot to, because the advertising competition is crazy, and when there’s people out there that are willing to, all these startups, and some of the major companies are willing to just break even to take over market. That’s hard, it’s really hard. Price to run something is a factor. Sometimes 30% works really well for us, sometimes, honestly, we go way over, in certain services. Sometimes, that’s not even enough. Then other times, it’s a big enough client, I don’t want anyone to think I use 30% flat, like, we do plenty of 20%, but they’re six figure budgets. Steffen Horst: That makes sense, that makes total sense. So, to kind of find an end to this pricing part, what’s your view on performance pricing. Basically saying, I think back in the day when you started and when I started in 2004, in paid search, there were a lot of costs per acquisition goals. Or cost per sale goals. What’s your experience with that, and nowadays, what is your view? Chris Ranier: When I’ve been on the other side and had a commerce site, I’ve hired people that say they can do that, and it never ends well. Right? I’ve also offered to be that kind of agency and that doesn’t end well. Some people do it, I mean, when you’re doing a cost per conversion. Even then, it’s almost impossible, unless you say it’s really going to be higher, unless you do an arbitrage, which again, you’ve got to really know the market well, because the market fluctuates so much, so many different things can happen, that if you screw up one time, one big natural even happens, then your costs per lead or cost per action, whatever it is, goes through the roof and you don’t get paid. You’re sunk, like, how do you make that back? So, the entrepreneur in me, the business owner in me wants to say, well, you’re so good, you should do it, but as a business owner, I need to be good at that. The agency is just a piece, is product good, is my customer service good, is my ecommerce engine good, is the person picking up the phone good, is my messaging good, have paid for enough money for my creative, cause the place is only a piece of it. All that stuff. The people that do this go, well we’re basically going to run your business. Then, what do you do? I guess if we could have handed over our, but even then, you’ve got to own your brand. Your brand is what sells your product. So, handing that over to somebody is a little dangerous. Steffen Horst: No, I totally agree. So, if you were to do a performance model, what we sometimes see or have seen in the past, is that if you agree to something like that, and things work quite well, results are met, client is happy, year two comes, and the client goes, you’re doing well right? Let’s lower the fee, because I want you to lower the fee. How would approach that conversation, given that, for example, you have to give your people bonuses, salaries increase, cost most likely for the business increases by year two. How would approach that challenge? Chris Ranier: Well, if I was doing that well, I’ve got to believe that clients looking at it going, I don’t want to pay him that much. But he or she’s also saying, god, I can’t do without him. I think it’s a polite conversation of, we’re doing well, but that’s what we’re getting paid to do, and if you want to pay us less, you get what you pay for. So, don’t expect the same results, and in fact, I don’t know if we want to do that, because I’m pretty proud of what we’re doing now, I’d like to continue that and I’m pretty sure I can do it with other folks. I am doing it with other folks, assuming if you’re that good. This is a really hypothetical situation, if you ask me. If I’m doing that great and the numbers worked before, then let’s keep going. But, if I look at the numbers and go, we’re making too much, then you start tiering it. I think I’ve done this before, I’ve set it up in such a manner. If I were on the business side, I would tier it as well, you’re going to make so much up to a certain level, then so much a little less at next level, and a little less at the next level. That’s probably actually fair, because you’re starting to scale, at some point. Steffen Horst: That makes sense. Well, I just had a look at the clock and we’re already 35 minutes in, although I have a couple more questions. To kind of find an end to our conversation, which has been great so far, where do you see, Chris, opportunities in the future, to get in front of a trend. If you were back in 2002, when you founded Fathom Online, you were kind of riding the early wave, is there anything in the media, in the creative space, where you feel, that’s the next thing that in two or three years all agencies will offer, and no one has seen the opportunity yet? Chris Ranier: Not anything that’s going to knock anybody over. I have one that people are probably going to go, really? Obviously, the voice search and voice interaction through artificial intelligence, like, that’s going to come faster than most people think. That’s going to come overnight, I think. It’s just, every report says that, right. I also don’t think we focus on it enough, including businesses, I mean, the consumer is going to drive that. The one that smaller agencies, regional agencies, like myself. I think may not be paying enough attention to, and it’s going to sound stupid, but influencer marketing has not even really caught on with the big guys. A couple big brands are using it, but they’re still figuring it out, if you really dig into it. At the regional level, the brands we have, we talk about influencer marketing, but we’re two or three influencers, and we don’t even get the platform. It’s not near as big as it’s going to get. I’ll give you a good example, so 46 Mile is actually owned by Hearst, Hearst is $11 billion company, it would be a Fortune 5000 company. So, I was talking to somebody in the organization, higher up in the financial side, they’re excited about affiliates. They think affiliates, that’s the thing they’re getting into now. I’m like, really? They’re seeing people, like slick deals, and some of the other like, these guys are making big volume and they only have 40 people working for them. I almost didn’t know how to respond, but in hindsight, I’m looking, that’s just what it takes to get to the sophistication, now the Best Buys and all these other guys, who really haven’t been using affiliate marketing as efficiently as they could, are really jumping on a bandwagon, and they’re using it to push their digital number, whether it actually makes it a profit or not, because their bonus gets paid on their digital revenue as opposed to the brick and mortar revenue. If the finance works, then good. My reason of bringing up that example, is you had the same reaction I did, like really? Like come on, about time, but it’s not, influencers in our world, people know to go there, but they really don’t. Micro-influencers are just getting their day, they’ve been talked about for years, but they’re just getting their day, and a hundred million dollar company has no idea how to use influencers properly. So, coming up with influencer solutions that match a company that’s not a Coca Cola and not some major lifestyle, but like a regional brand, that I think you can make a big dent. That’s one of the things we’re doing. Steffen Horst: Interesting, well, maybe we have to have you on here again to talk about influencer marketing, a little down the road. Chris Ranier: It’s just shocking sometimes, what the opportunities are. Steffen Horst: I hear you. Well, Chris, thank you so much for your time. It’s been a pleasure talking to you about how to price your services for success. If someone is looking for an agency that can help them to develop a regional or multi-regional marketing initiative, how can they get in touch with you? Chris Ranier: The best way, the easiest way to remember is just 46mile.com, the number four, the number six, and the word mile, dot com. Hopefully, you will easily find the contact stuff, if my guys did their job right, it’ll be easy to find a number or an email. Steffen Horst: Okay, great, we’ll put it in the link when we post this. Well, thanks everyone for listening. If you liked the Performance Delivered podcast, please subscribe to us and leave us a review on iTunes or your favorite podcast application. If you want to find out more about Symphonic Digital, you can visit us at SymphonicDigital.com. Or follow us on Twitter using our handle: @SymphonicHQ. Thanks again and see you next time.